This essay is part of the larger radio documentary Teaching Teachers, which you can listen to in its entirety on this website or on our podcast feed (iTunes). In the early 1990s an American researcher named Catherine Lewis was working on a book about education in Japan. The book had nothing to do with how kids learned math, but sitting for hours in Japanese classrooms she realized she was learning all kinds of interesting things about math that she’d never thought about before. She noticed, for example, that there are many ways to figure out the area of a parallelogram. When she was in school, this had been taught to her as a formula. She’d never been asked to think about what the formula meant or where it came from. She was just expected to memorize it. In Japanese classrooms, however, teachers took a different approach. After learning how to find the area of a rectangle, students would be given a parallelogram. Their task was to take what they knew about rectangles to try to figure out the area of this new shape. She asked the Japanese teachers — how did you learn to teach this way? These teaching strategies came from the United States, they told her. But these teaching strategies had come from the United States. American researchers and mathematicians had been advocating since the 1980s for what is known as a “problem–solving” approach to teaching math. But this problem-solving approach hadn’t made it into American classrooms. This was really curious. Education ideas developed in the U.S. weren’t being used by American teachers, but they were being used in Japan. Lesson study is a form of professional development Japanese teachers use to help them improve and to incorporate new ideas and methods into their teaching. It turns out math lessons in Japan used to look a lot like lessons in the U.S. — lots of memorizing formulas, not much hands-on learning or exploring mathematical ideas and concepts. But when researchers develop new ideas about teaching and learning, Japanese teachers have an effective way to learn those new ideas, and practice them. The name for lesson study in Japanese is jugyokenkyu. “Jugyo” means teaching and learning. “Kenkyu” means study or research. So, the study or research of teaching and learning. Here’s how lesson study works. A group of teachers comes together and identifies a teaching problem they want to solve. Maybe their students are struggling with adding fractions. Next, the teachers do some research on why students struggle with adding fractions. They read the latest education literature and look at lessons other teachers have tried. Typically they have an “outside adviser.” This person is usually an expert or researcher who does not work at the school but who’s invited to advise the group and help them with things like identifying articles and studies to read. After they’ve done the research, the teachers design a lesson plan together. The lesson plan is like their hypothesis: If we teach this lesson in this way, we think students will understand fractions better. Then, one of the teachers teaches the lesson to students, and the other teachers in the group observe. Often other teachers in the school will come watch, and sometimes educators from other schools too. It’s called a public research lesson. During the public research lesson, the observers don’t focus on the teacher; they focus on the students. How are the students reacting to the lesson? What are they understanding or misunderstanding? The purpose is to improve the lesson, not to critique the teacher. In the United States, we tend to think that improving education is about improving teachers – recruiting better ones, firing bad ones. But the Japanese think about improving teaching. It’s a very different idea, says James Hiebert, an education researcher at the University of Delaware who has written about lesson study. Hiebert says to improve education in the United States, we need to shift from thinking about how to improve teachers to thinking about how to improve teaching. Lesson study is one way to do that, he says. Some American teachers are doing it, but it’s harder to do in America than in Japan. Jasmine Bankhead needed to figure out a way to improve teaching at her school. It was 2013. She was the new principal of the O’Keeffe School of Excellence, an elementary school on Chicago’s South Side that had been struggling for years. Finally, the school district had taken dramatic action by firing the principal, the staff and all the teachers. That’s when Bankhead was hired. Her job was to turn a failing school into a successful one, with all the same kids, but an entirely new teaching staff that she got to choose. Bankhead had a very clear idea about what kind of teaching she wanted to see at her school. She calls it “inquiry-based” teaching. It’s an approach, supported by research, that begins by posing questions to students rather than presenting them with facts or knowledge. It’s the opposite of the way she was taught. To help the teachers at O’Keeffe learn how to do inquiry-based teaching, she gave them training. Lots of training. She set up workshops and sent them to professional development days. But, it wasn’t working. She and her administrative team would visit classrooms, hoping to see all this great inquiry-based teaching. What they saw instead were a lot of teachers standing at the front of the room, talking. The teachers were learning about inquiry-based teaching at the workshops, but they didn’t know how to actually do it when they got back to their classrooms. So they fell back on what they remembered about how their teachers taught, says Bankhead. This is a common complaint about the traditional approach to teacher professional development in the United States. Teachers go to workshops and professional development days where they might get great new ideas about teaching. But when they get back to their classrooms and try to put those ideas into practice, all kinds of questions come up. And the expert who led the workshop isn’t there to help. Often, there’s no one to turn to for help. Teachers in the United States have been expected to go into their classrooms, shut their doors, and figure things out on their own. Bankhead and her administrative team realized the typical American approach wasn’t going to work if they wanted to dramatically change teaching at their school. One of the O’Keeffe assistant principals had recently learned about lesson study in a class taught by a Japanese professor. They decided to get in touch with the professor, see if he could help them. Akihiko Takahashi is a professor of math education at DePaul University. Before that, he was an elementary school teacher in Japan. He first came to the United States in the early 1990s looking for all the great approaches to teaching math that he and his colleagues in Japan had learned about from American researchers. When he couldn’t find these approaches being used in classrooms, he soon realized why: There was no lesson study in the United States. Takahashi now helps run an organization called Lesson Study Alliance that helps American teachers, mostly in Chicago, learn lesson study. He started it with a former American teacher, Tom McDougal, who was frustrated with the lack of good professional development in U.S. schools. Since 2010, McDougal and Takahashi have worked with more than 20 schools in the Chicago area. One of them is O’Keeffe. I visited O’Keeffe in January 2015 to talk with teachers about their experience with lesson study and to see a public research lesson. One of the first things to understand about lesson study is that it’s a long process, kind of the opposite of the one-day workshop American teachers are used to. Teachers come together to identify a problem they want to solve. Then they spend months doing research and planning a lesson. I spent most of my time at O’Keeffe with a group of three teachers who had been working together as part of a lesson study group since the previous summer. Angela Flores and Melissa Warner teach third grade. Wanna Allen teaches fourth grade math and science. When they first came together to identify the teaching problem they wanted to solve, they had several things on their mind. One, they knew the overall goal for the school was for teachers to work on inquiry-based teaching. Two, they were thinking about the Common Core. That’s a set of new education standards that lay out what kids should know and be able to do in each grade. Teachers at O’Keeffe – and across the country – are still figuring out how to teach the standards. Lesson study, they thought, would be a good way to do that. “I’d rather struggle together than struggle by myself,” says Flores. She liked the idea of lesson study right away. Flores, Warner and Allen decided to plan a math lesson that would focus on the third grade Common Core math standards for geometry. They noticed that kids often struggled with understanding how to find the area of a shape. Memorizing the formula “length times width” wasn’t a problem for many of them, but they didn’t seem to understand what the formula meant. If they were asked to find the area of an odd shape — a parallelogram or a few rectangles put together — kids often had no idea where to begin. It took months of planning and consultation with McDougal and Takahashi to come up with a lesson plan. “It’s a lot of meeting after school,” says Warner. That gets a laugh from her colleagues. They don’t get paid for this extra time. Their principal, Bankhead, does arrange for subs to come in occasionally to free them up for planning. But for the most part, doing lesson study requires teachers to be willing to work at night and on weekends. After nearly six months of planning, Allen, Warner and Flores are ready for their public research lesson. Warner has volunteered to teach it. The lesson takes place on a Friday afternoon. Third-graders have gotten special permission from their parents to stay after school. They get a quick snack of pizza and then file back into their classroom, where a crowd applauds for them as they enter and sit down at their desks. The crowd includes teachers from O’Keeffe plus some visitors from another Chicago school where administrators are thinking about starting lesson study. McDougal and Takahashi are here too. The observers are all holding clipboards and iPads, ready to take notes. All this week in class, kids have been learning how to calculate the area of a rectangle. They’ve learned the standard algorithm, length times width. They’ve also learned a method called “tiling.” That means dividing the rectangle into units and counting up the units. Warner gives each student a copy of the shape. “I want you to start thinking about some ways you could find the area,” she says. The kids begin working, quietly, on their own. Ms. Warner walks around the room, leaning over each kid, taking notes on what they’re doing. Occasionally she asks a kid to explain his or her thinking. But she doesn’t tell them what to do. She just listens and observes. This is a technique she learned from doing lesson study. It’s a technique Japanese teachers commonly use. There’s actually a name for it in Japanese. Teaching between the desks. In Japanese, there are a bunch of words and phrases that describe specific things teachers do to help children learn. This vocabulary about teaching comes from years of doing lesson study. We don’t have this kind of vocabulary in the United States. Warner gives her kids several minutes to work on figuring out the area of the L on their own. Then she calls them to the rug at the front of the room where they’re going to talk about how they did the problem. One of the goals of this lesson is to help kids learn how to “construct viable arguments and critique the reasoning of others.” This is something that comes from the Common Core. “Jimetta, could you explain to us what you started to draw in your shape here?” The kids are on the rug, crowded around Ms. Warner, eager to share their methods for finding the area of the L.
Jimetta starts to explain, some other kids chime in, and pretty quickly, there’s confusion. Some students calculated the perimeter of the L instead of the area. This is something Ms. Warner was expecting. As part of the lesson study process, teachers think ahead of time about how kids are likely to respond to the lesson. What are the common misconceptions? What are kids likely to do wrong? Warner and her colleagues came up with a list of 18 different incorrect methods for finding the area of the L. Her goal here on the rug is to go through some of those incorrect methods, see if other students can find the flaws, and eventually steer everyone in the direction of methods that work. “Dre’Shawn, bring up what you were just talking to Kenneth about,” Ms. Warner says. She knows that Dre’Shawn and Kenneth have not confused area and perimeter; it says so right there in the notes she was taking as kids were working on their own. “Kenneth and I said that you don’t supposed to count all the sides, you only supposed to count the vertical and the horizontal,” says Dre’Shawn. He’s up on his knees, excited to share what he knows. “Yeah! Exactly!” say some of the kids. But others look confused. There’s a lot of back and forth about the difference between area and perimeter. It gets a bit loud and rowdy, and Dre’Shawn is getting antsy because he wants to show the class how he found the area of the L. Finally, Ms. Warner calls on him. “I put one line on the side, ’cause I wanted to make both of the problems into a separate,” says Dre’Shawn. He’s having a hard time explaining his method, but he did it right. He divided the L into two rectangles and calculated the area of each one. Ms. Warner shows the class what Dre’Shawn wrote on his paper. There are lots of “oohs” and “ahs” from the kids. This seems to be a breakthrough moment. To see if students really get it, Ms. Warner asks them to turn to the person next to them and talk about Dre’Shawn’s method. The class erupts into conversation, and it’s clear pretty quickly that lots of kids are still confused. “I don’t really get that,” says one girl, looking grumpy. Warner is kind of down on herself. She thinks most of the kids didn’t get it. But then a really interesting thing happens. One of the O’Keeffe teachers who had nothing to do with the planning for this lesson comes to the front of the room and leads a post-lesson discussion. This is where the visitors in the room share what they observed. Their job was to watch the kids. How were the students reacting to the lesson? What were they understanding or misunderstanding? They’ve gathered all kinds of information that one teacher leading a lesson could never gather on her own. This information helps Warner see that more of the kids may have gotten it than she realized. This prompts a discussion about how the lesson might be structured differently next time. Maybe it’s not a good idea to bring kids to the rug to talk. Maybe that was too confusing and chaotic. The post-lesson discussion focuses on whether the lesson worked, not whether the teacher did a good job. When the discussion is done, Warner looks relieved. Warner says lesson study has helped her think about teaching in a new way. She was more focused on whether kids could demonstrate what they’d learned on an assignment or a test. She was less aware of how kids were actually learning. Now, she says, there’s someone to give you feedback and say, try it this way. Teachers at O’Keeffe haven’t been doing lesson study long enough to know what kind of impact it’s having on student learning. 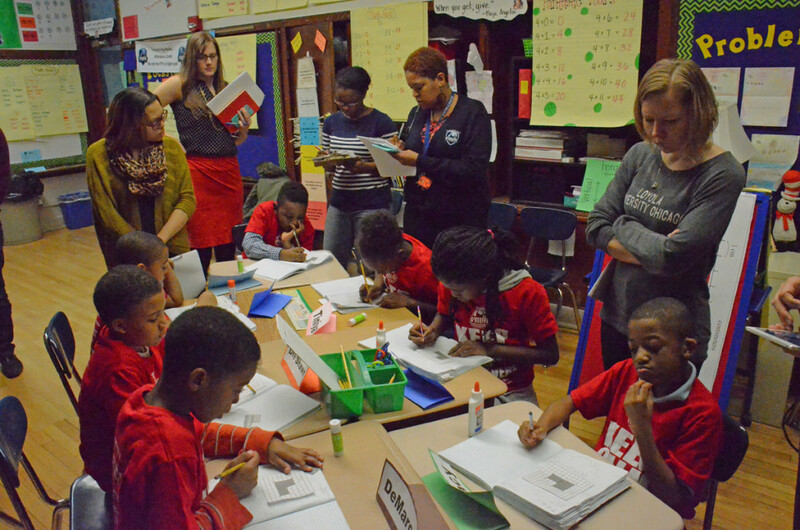 Other schools in Chicago that have been doing lesson study have seen test score growth, but there’s no way to know for sure whether that’s because of lesson study. There is some evidence that lesson study improves teaching. A recent review of research on professional development in the United States looked at 643 studies on approaches to improving math teaching. Only two of the approaches were found to have positive effects on students’ math proficiency. One of them was lesson study. Jasmine Bankhead, the principal at O’Keeffe, believes lesson study is having a big impact at her school. Catherine Lewis, the American researcher in Japan who got so interested in lesson study back in the 1990s, has been helping teachers in the United States learn lesson study for 15 years. She recently asked one of the teachers she’d been working with, what’s the biggest change with lesson study? It’s hard to know how many teachers in the United States are doing lesson study. There’s no official count. Lewis estimates thousands of teachers are doing it. There’s even a whole state that’s trying it: Florida, which got a federal grant in 2010 to encourage its schools to adopt lesson study. But lesson study can be challenging in American schools. There are practical challenges, like finding time for teachers to plan together and watch each other teach. Japanese teachers have this kind of time built into their work schedule. And there are cultural challenges. The organizing principle behind Japanese lesson study is that the best ideas for improving education come from teachers. It’s a bottom up kind of approach. In the United States, education improvement tends to be top-down. “The American approach has been to write and distribute reform documents and ask teachers to implement those recommendations,” says Hiebert. Lesson study flips the script. It’s one of the reasons so many American teachers who try lesson study like it. But it’s also why lesson study can be a fragile enterprise in the United States. There are plenty of stories about educators who start lesson study, then a new principal comes in with a different idea about how to do things, and lesson study falls apart. Another challenge for lesson study in American schools is the fact that it’s a long and intensive process. We have this attitude about teachers too, he says. Research shows that teachers in the United States improve the most early in their careers, but after about three to five years in the classroom, they’re about as good as they’re going to get. If you’re not a great teacher after a few years, you might as well quit or be fired. That’s the thinking in the United States anyway. But in Japan, you’re not considered an expert teacher until you’ve been in the classroom for at least 10 years. The Japanese take teacher learning seriously, Hiebert says. They believe teachers will improve if they work in a system that values improvement. The United States needs that kind of system, he says. In 1993, a group of researchers set out to do something that had never been done before. They would hire a videographer to travel across the United States and record a random sample of eighth-grade math classes. What they found revealed a lot about American teaching. In the United States, teaching isn't treated as a profession that requires extensive training like law or medicine. Teaching is seen as something you can figure out on your own, if you have a natural gift for it. But looking for gifted people won't work to fill the nation's classrooms with teachers who know what they're doing.